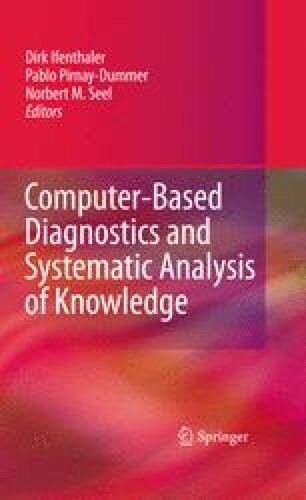 This chapter describes an approach for analyzing lexical aggregates (i.e., ALA) from network diagrams such as concept maps and from texts such as essays in order to establish individual and group knowledge structure representations. We describe two free software tools that were designed to work with Pathfinder Network analysis, ALA-Mapper for analyzing network diagrams and ALA-Reader for analyzing text. The derived knowledge structure representations can be compared to each other, for example, to compare novices to an expert, or can be combined into a group representation, for example, to compare one team to another team. Several investigations are reviewed that have used these tools. Then, possible applications and also limitations of the software and the approach are described. Finally, the next stage of software development for these tools is described. Clariana, R. B., & Koul, R. (2004). A computer-based approach for translating text into concept map-like representations. In A. J.Canas, J. D.Novak, & F. M.Gonzales (Eds. ), Concept maps: Theory, methodology, technology, vol. 2, in the Proceedings of the First International Conference on Concept Mapping, Pamplona, Spain, Sep. 14–17, pp. 131–134. See http://cmc.ihmc.us/papers/cmc2004-045.pdf.